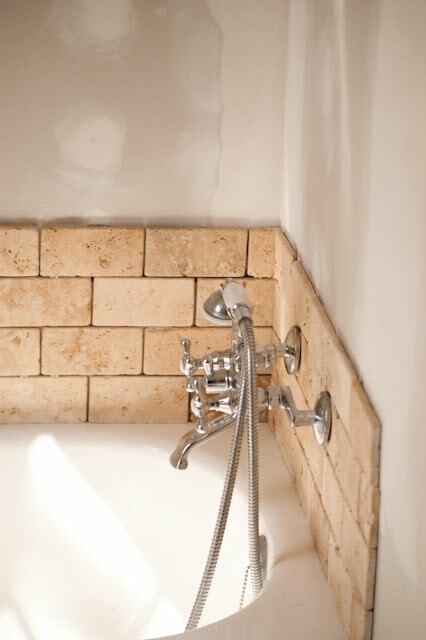 That looks beautiful already - travertine - even sounds right - glorious stuff. Makes me think of old castles and cobblestone paths. Beautiful, indeed! I especially love the stone in your bathroom. Oh, exciting! 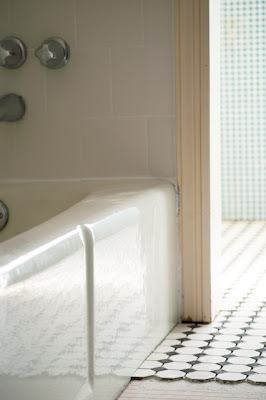 Replacing a worn out bathroom or kitchen can make the whole house feel new. That meal sounds amazing. It's going into my file. How restful a beautiful bathroom is! We have very similar black and white tile in our bathroom. We had to rip out our 1930s tile, but we replaced it with the exact same tile because we loved it so much. Ours has pale blue-grey walls above the wall tile. . . and a sherbet-orange curtain. Your chicken reminds me of my chicken and dumplings that I made last week. Good AND filling. Oh Anna, that chicken dish sounds so good. And it sounds simple and nourishing. The bathrooms? Looking lovely - black and white floor tile in a bathroom is just right. 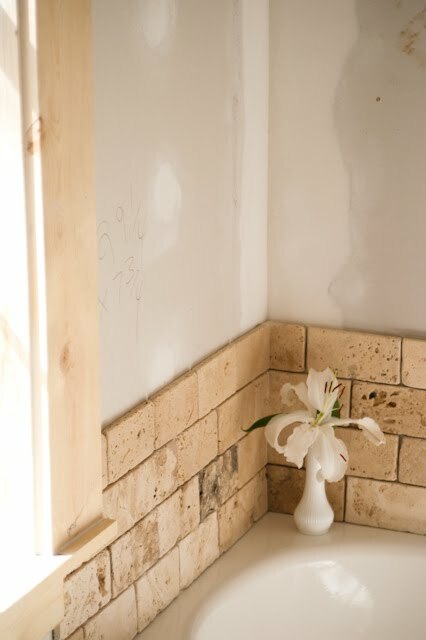 And I think you are going to love that travertine. Travertine sounds like something from ancient Rome. Don't know what showerboard is, but it doesn't sound very good. Oh, how I wish I was in serious need of calories! I love the redo of the bathrooms. Just beautiful. Well. The travertine is gorgeous. 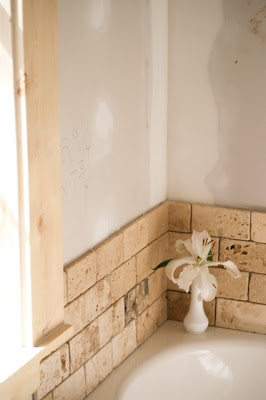 It is inspiring me to get back to my delayed bathroom renovation plans. And I love the floor, too! Beautiful. The meal sounds wonderful, and great for a hungry crowd--next time I have a hungry crowd, I may whip it up. But not anytime soon--my husband is 'in training' (running) and would not appreciate extra calories. But maybe if I can convince him to train for an ultramarathon--he'd need them then, right?!? I've been wanting a proper creamed chicken recipe, so thanks for posting this :) My own version isn't really creamed chicken but more of a stew served over biscuits. Basically it's a mirapoix sauteed with butter, salt, and pepper and then stewed with white wine, chicken stock, shredded chicken, parsley, and a little Parmesan, thickened with cornstarch or arrowroot, and served over biscuits.